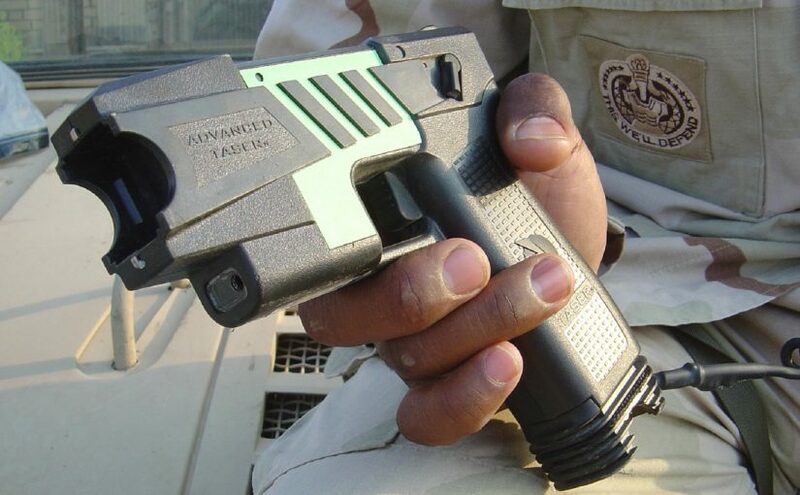 Actually known as electroshock guns, tasers fire projectiles fitted with barbed hooks. Wires connected to these conduct shocks of 50,000 volts, thereby inducing a state of temporary paralysis. While their manufacturers claim that taser guns are a “non-lethal weapon”, critics prefer to use the term “less-lethal weapon”. According to reporting by the Guardian daily newspaper, at least 47 people died in the USA following the use of taser guns as of November 2015. Only the Special Deployment Commando (Sondereinsatzkommando, or SEK) has used such equipment in Berlin to date. The unit procured type M26 taser guns from the company of the same name. According to the response to a minor interpellation by the Pirate Party parliamentary group from the year 2013, these weapons have been used on a total of 18 occasions since they were introduced in 2001. They were deployed four times in the context of “threat scenarios” and in 14 incidents relating to attempted suicides. Five further deployments were added to that number as of 2016. It was the former coalition of Christian and Social Democrats that decided to introduce electroshock weapons in Berlin. In the summer, the then Senator of the Interior Frank Henkel (CDU) announced their three-year test phase. Critical opinions were voiced by The Greens and The Left Party. It was also at that time that Henkel had the necessary regulations for the use of taser guns by patrolling police officers amended. The approval of the Berlin House of Representatives was not required for this as, in legal terms, taser guns are considered to be firearms. The threshold for their use is therefore much higher than is the case for irritant gas and pepper spray. A legislative amendment would be necessary in order to classify tasers as “additional auxiliary equipment for exterting physical force”. The then coalition partner, the SPD, withheld its support for the CDU in this regard. Following the test phase, the SPD in the current coalition with The Greens and The Left Party could decide to classify taser guns as “auxiliary equipment” with the result that fewer limits would be imposed on the use of such weapons. Alexanderplatz, which made headlines on account of a number of violent incidents last year, was prominent in Henkel’s mind. The former Senator of the Interior believed that taser guns had the potential, among other things, to help to prevent fatal shootings by the police. In 2013, for example, the police shot and killed a mentally disturbed man after he had climbed into the Neptune Fountain on Berlin’s Alexanderplatz. On the day after the introduction of taser guns was announced, the Berlin police in the Hohenschönhausen district of the German capital likewise shot a mentally disturbed man who was holed up in his apartment with a knife. After the man had himself called the emergency services, the officers broke down the door and opened fire as the man continued to brandish the knife in the corridor.